If you are the Oneplus one user and most of the time you are installing the custom ROM or Cyanogenmod CM 12 Android 5 ROM on your device. But most of the time when you are installing Custom ROMs on your phone, you are facing some problem like bad battery performance, or some other problems. At that time it was recommended to do a clean installation of the ROM on your phone. This will help you to improve the performance of your device. 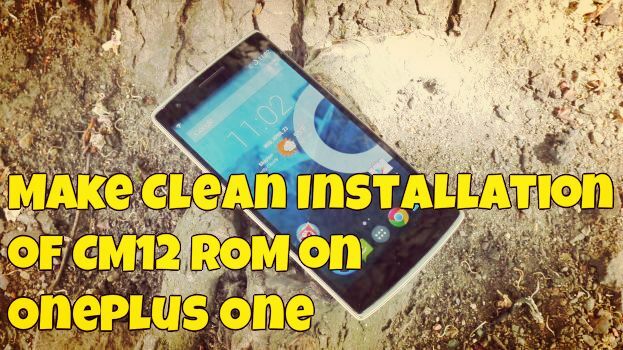 Today in this guide we’ll show you how to do a clean installation of CM 12 ROM on One plus one, you can also use this guide with some other custom ROM or with the Stock ROM fastboot zip file. The guide is pretty simple and take some time to complete the process. To get started you need a OTG Cable with USB drive or OTG USB Drive, CM 12 Rom Zip file, Google app zip package. Yes this guide is only for those user who already unlocked the bootloader of the phone and running the TWRP recovery on the phone. Before following this guide do take the full backup of your phone, you will lose all your data, messages and contacts. Step 1. First unlock the bootloader of Oneplus and Install latest TWRP recovery from here. Step 2. Now download the OnePlus One CM 12 Nightlies here and Download the Gapps package here and move the both zip file to the OTG USB Drive. Step 3. Now switch off your Oneplus android and boot it in recovery mode. You can do this on your OPO by holding both the volume down and power buttons. So after that, no OS is installed. Step 5. After that Reboot to recovery. -Select Install zip and Flash the CM 12 ROm Package first and after that Flash the Google apps package on your phone. Step 7. Now Reboot the system from recovery main menu and the first boot will take some time. Step 8. After the first boot, turned off the device and reboot to recovery mode again. Don’t select the system option this time, otherwise you will lose the OS again. Let the phone boot up and settle its first background processes 3-5 minutes and you are ready. Now you phone has the CM 12 ROM with Clean installation. Enjoy!